At Sustainativity, we like to do some pretty cool stuff. Below you’ll find more information about upcoming and past events, as well as ways you can get involved. 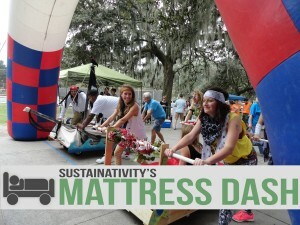 Sustainativity’s Fourth Annual Mattress Dash takes over Forsyth Park on October 15th – don’t miss the most unique racing event in Savannah! Bring your buddies, beds and beverages and join the festivities! Don’t have a bed frame or know where to start? It’s easier than you think – you can make a bed from wooden pallets in less than 2 hours! Contact us if you need some help! Join us for the 2017 Green Tie One On – coming back bigger and better than ever! 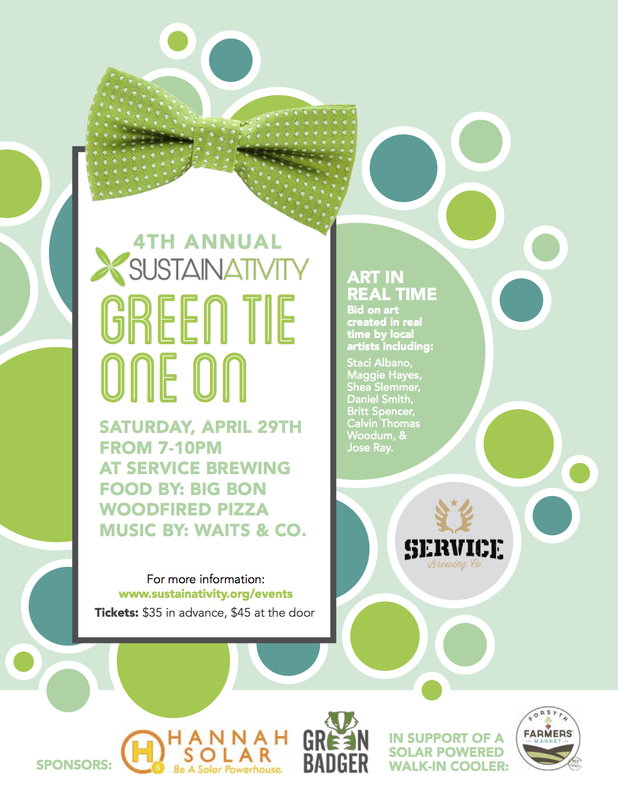 On April 29th, 2017 from 7-10 PM, Sustainativity is taking over Service Brewing to host the best live art event in town, great music, food and drink. Join us as a dozen of Savannah’s most creative artists paint, sculpt and sew live during the party – then bid on their work to take home with you! Artists include Staci Albano, Tara Garrigan, Maggie Hayes, Sean Keeth, Shea Slemmer, Daniel Smith, Britt Spencer, Calvin Thomas Woodum, Jose Ray and Shannon Snow! Enjoy Services many varieties of craft beer while nibbling on wood fired pizza from Big Bon and jamming to great local music from Waits and Co. Proceeds help provide a solar-powered walk in cooler for the Forsyth Farmers Market to support their FarmTruck912 project to provide fresh, local food to disadvantaged portions of our community. Contact us for sponsorship opportunities for this fantastic event! Special thanks to our honored host committee! 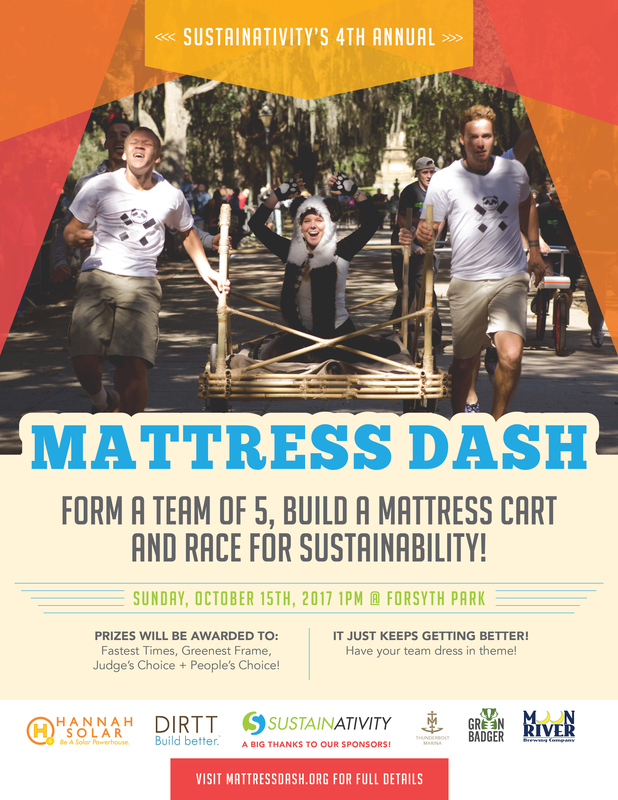 Sustainativity’s Third Annual Mattress Dash takes over Forsyth Park on October 16th – don’t miss the most unique racing event in Savannah! Bring your buddies, beds and beverages and join the festivities! Don’t have a bed frame or know where to start? 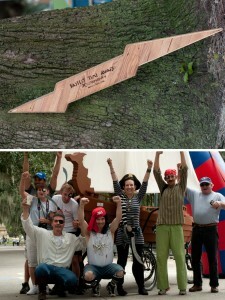 Join us on September 24th from 11-3 at Savannah Bike Campaign (1301 Lincoln St) for a hands-on bed building workshop! Please let us know you’re coming. All proceeds will go towards providing a net-zero, solar powered walk in cooler for Farm Truck 912 a mobile farmers’ market that brings local fruits and vegetables to Savannah neighborhoods with the least access to healthy food. Save the Date for the 2016 Green Tie One On – coming back bigger and better than ever! 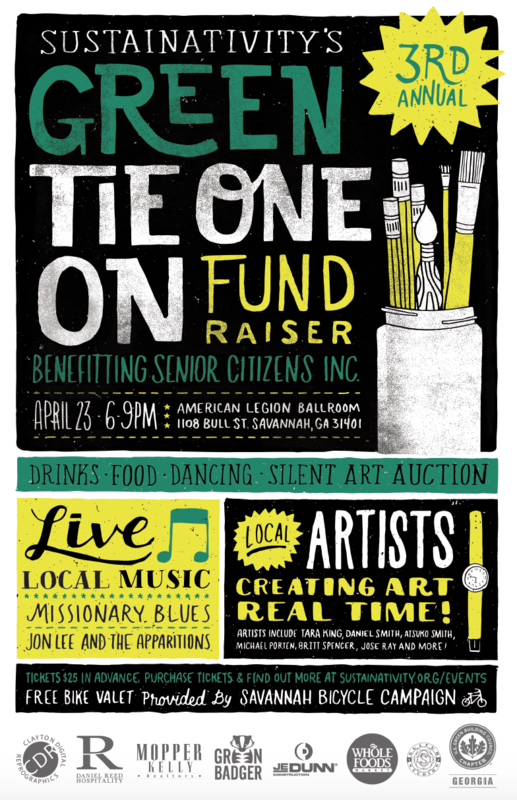 On April 23rd, 2016 from 6-9 PM, Sustainativity is taking over the American Legion to host the best live art event in town, great music, food and drink. Join us as a dozen of Savannah’s most creative artists paint, sculpt and sew live during the party – then bid on their work to take home with you! Artists include Tara Conway, Daniel Smith, Atsuko Smith, Michael Porten, Britt Spencer, Wendy Martin, Alexis Javier, Jose Ray and Tim Foster! Free bike valet provided by Savannah Bicycle Campaign – ride down to avoid parking hassles! 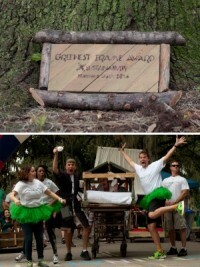 Sustainativity’s 2nd Annual Mattress Dash is back with a vengeance! 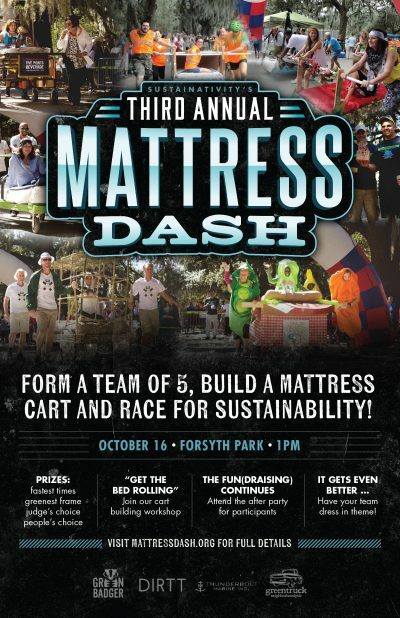 Join us on Sunday, October 18th as we again take over Forsyth Park and race teams of 5 head to head for the ultimate bragging rights – Mattress Dash Champion. Will Thunderbolt Marine be the first to repeat? Can Metro Rotary Avenge their loss? Are the girls of Bed of Roses still the fan favorite? Come out on October 18th at 1 PM. 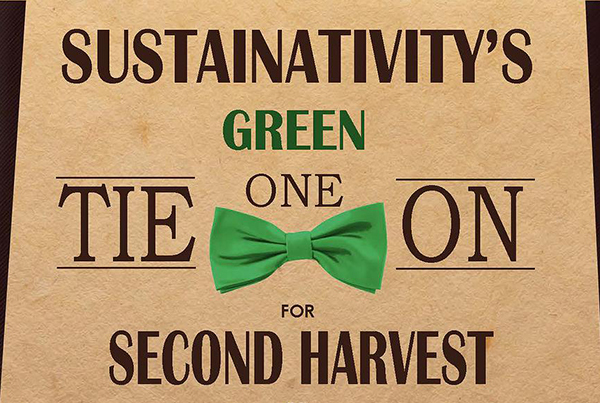 Sustainativity’s 2015 Green Tie One On is the one event you can not miss this spring! 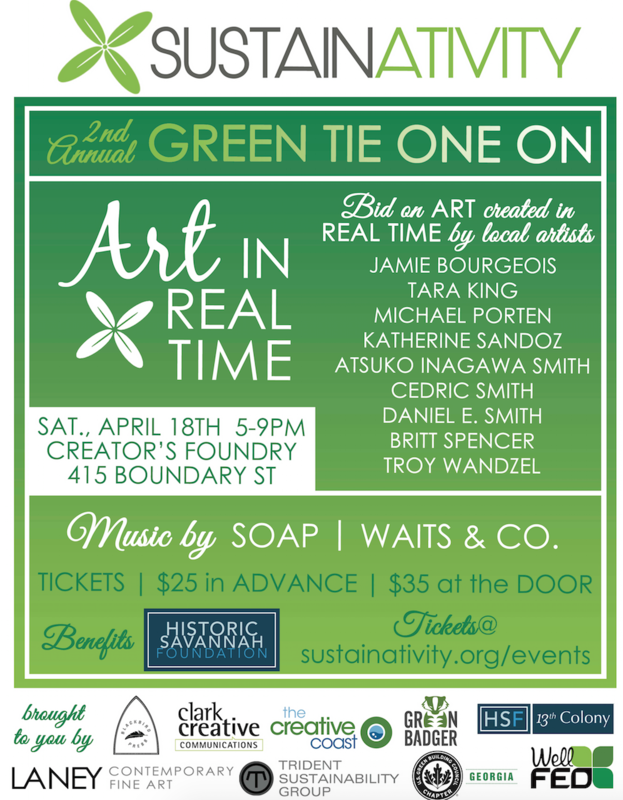 Featuring live music by Waits & Co. and Soap, great food and wine, and a silent auction featuring the work of 9 Savannah artists – being created in real time while you watch! Artists include Jamie Bourgeois, Tara King, Michael Porten, Katherine Sandoz, Atsuko Inagawa Smith, Cedric Smith, Daniel E. Smith, Britt Spencer and Troy Wandzel. The 2015 Green Tie One On is the perfect culmination of art, historic preservation, sustainability and community. Proceeds from the event will go directly towards Sustainativity’s green retrofit of Historic Savannah Foundation’s Sheftall House, including added spray foam insulation, interior stormwindows, LED lighting and low flow plumbing fixtures. Featuring a taste off of local breweries Come sample the finest suds Savannah has to offer from Southbound, Moon River, and Coastal Empire Brewing Company – you’re vote will help determine Savannah’s brewing champion for 2014! Food provided from Second Harvest’s own chefs! Sustainativity is a unique 501c3 that provides direct philanthropic investments in sustainability solutions. Proceeds from this event will help fund a comprehensive lighting retrofit of Second Harvest’s facilities a project that will save an estimated $3,000 annually, providing an additional 15,000 meals to the less fortunate in our community every year for the foreseeable future!